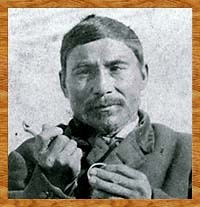 Charles Edenshaw, or Tahayren, was born in 1839 to Albert Edward Edenshaw's only sister, Qwa'Kuna. According to Charles's daughter Florence Edenshaw Davidson, her father started carving argillite when he was fourteen and had to stay in bed sick. Charles Edenshaw carving a silver bracelet amidst examples of his argillite model poles and a box. The damage to his left eye from a revolver accident bothered him as he got older but did not affect the exquisite sense of balance and symmetry in his carving. While training in his uncle's workshop, Charles perfected his knowledge of ancient traditions, perfected his technique and learned to observe nature . . . To mark his acquiring the master craftsman's position in the community, he gave a potlatch, or feast for the village, in his uncle's home. Charles married Isabella K'woiyang, whose Aunt Amy was the second wife of Albert Edward. In the 1870s, he carved two poles for Chief Skidegate. The first was an interior house post of a Whale, a Frog and the Raven with a long beak. The second, which he may have worked on with John Robson, was a mortuary pole for one of Chief Skidegate's wives, erected in 1879-80. The human figure on it was said to represent the lazy son-in-law story in which a youth killed a Wasgo (or Sea Wolf) in the lake behind Skidegate. The face on the pole is a tcamaos (supernatural snag). Charles's skills and repertoire expanded gradually to include work in wood, argillite and precious metals. In the 1890s, his artistry and traditional knowledge came to the attention of anthropologists and museum collectors engaged in the frantic effort to record and collect Haida art and culture before it died, including Charles F. Newcombe, Franz Boas and especially John R. Swanton. The Indian agent at Masset, Thomas Deasey, also kept him busy with orders for model argillite poles. A charming example of an argillite platter by Charles Edenshaw with a classic Thunderbird and Whale design. The double outline of formlines and changes of texture in background areas mark this piece as his, although neither he nor other carvers of that time signed their work. Acquired at Masset before 1899 for the A. Aaronson collection. Charles and Isabella had five daughters but only two sons, both of whom died young. 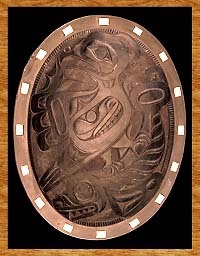 To ease his loss, Charles began teaching many young carvers Haida myths and the techniques of carving in a range of materials. Among those he taught were John Marks, Isaac (Ben) Chapman and Daniel Stanley (Skilgoldzo), the grandson of renowned Masset artist Simeon Stiltla. Charles Edenshaw's style is very distinctive, with very bold formlines. 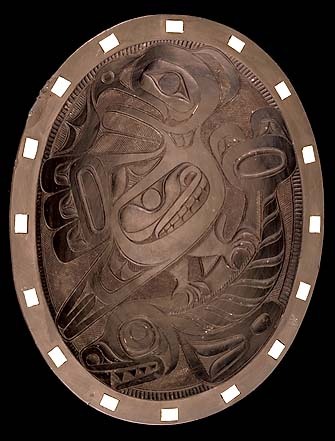 For Haida clients, he made pieces for personal adornment or practical use. Silver and gold jewellery, including earrings and finger rings, brooches and bracelets were in demand by both Haida and tourists. His wife, Isabella, wove baskets and hats that he painted with designs, mostly for sale to tourists. Argillite carvings for tourists represented most of his output, including inkstands, model houses, lidded chests and large platters. One of his major works, a traditional Haida burial chest, is in the Canadian Museum of Civilization. 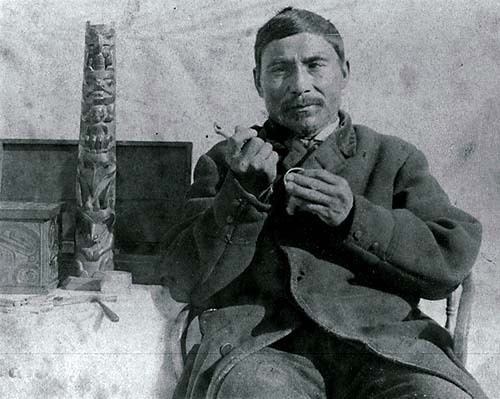 Charles Edenshaw died in Masset in 1924, leaving his tools to his nephew Charles Gladstone, a carver in Skidegate and the grandfather of noted artist Bill Reid.